The Samuel Ryder Foundation is commissioning a statue of Samuel Ryder for the centre of St Albans, UK. It will celebrate the man, his achievements, his character and his values and will seek to promote the association between Samuel and city in which he spent much of his life and in whose life he participated so much. It will be a piece of public art that the residents of St Albans can be proud of and which will bring many new visitors to the city. We seek to create a figurative statue in bronze, just over life size, designed to capture the essence of the man, his personality and elements of his life and achievements. It will be of the highest aesthetic worth and respond to the setting in which it stands in a position where it can be enjoyed by all. 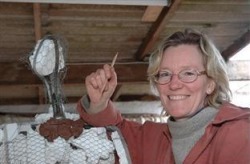 The sculptor Jemma Pearson is based at her studio in Clun, in South Shropshire. Her aim is always ‘to create pieces that capture a sure likeness and have the merit to stand as works of art in their own right’. Jemma’s work includes a magnificent sculpture of Darwin, commissioned in 2000 by Shrewsbury School, and the full sized portrait bronze of Elgar commissioned for Hereford Cathedral and unveiled in 2005. She was commissioned to produce a second Elgar, which is sited at the Elgar Birthplace Museum near Worcester, England. Her most recent public commission is a sculpture of former British Prime Minister William Ewart Gladstone for Glenalmond College, a school founded by Gladstone in the 1800's. The sculpture is in celebration of the Bicenetary of his Birth and was unveiled by Sir William Gladstone, the present holder of the baronetcy, on July 3rd 2010. Inspired early in her life by meeting both Henry Moore and Dame Elizabeth Frink, and also influenced by Jacob Epstein, Jemma works in the tradition of figurative sculpture. She now has a considerable body of highly acclaimed work behind her and is arguably one of the most exciting portrait sculptors working in the UK today.